When a bar opens on the site of the old Pinstripe Club (think Profumo, Keeler, O’Toole & others of that era), it has to be worth a visit or two. Taken on by the owners of the Barrio & Sovereign Loss bars, the re-design of this underground venue has really pushed what can be achieved in a linear & low-ceilinged space, creating areas of joy and mystery in equal measure. The central bar reminds me of the sadly long-closed Green Room club, once described as ‘designed for twenty, but hosting one hundred’, where I spent more than a few evenings pinned against the walls by my colleagues from many (some nights it seemed like *all*) of London’s theatres – although the bar in Disrepute is a lot more beautiful. And far less damp and dark. The key feature of the bar is the cocktail narrative – drinks are ordered by choosing from a menu of stories, or from a separate menu of ingredients – each drink only known by their initials. I had a ‘T’ on my first order, and mysterious and lyrical it was in equal measures. Disrepute (or DRP, if you will) will be a members’ bar in the late evening, but right now, a cheery demeanour & a pleasant smile should be enough to score you entry early in the evening; certainly, it got me seated with a friend at a fine table by the bar, and served by some of the most happy and cheerful staff I have ever met in London. Disrepute by name, but definitely not disreputable; fabulous, actually. It’s excellence has not been lost on others, either, Vogue magazine just named the newly-opened bar in its top 10 of London bars – quite an accolade for a place that has only been open since December last year. On Wednesday, I went to see the exhibition on John Dee, the Elizabethan scientist, sorceror & spy at the Royal College of Physicians, custodian of many of his books and artefacts. I went, not only because of an interest in Dee, but because I accompanied my friend, Lloyd Shepherd, who has written a historical novel that includes Dee – or more particularly his library – as a key element in his C19th story. Lloyd had seen some other of Dee’s books up close as part of his research for the novel (being published later this month, and I recommend you read it), but here was a rare chance to see some of the rarer books in the Royal College’s collection. The exhibition was great, but to end the afternoon properly, we needed something suitably traditional drink to toast the upcoming novel. 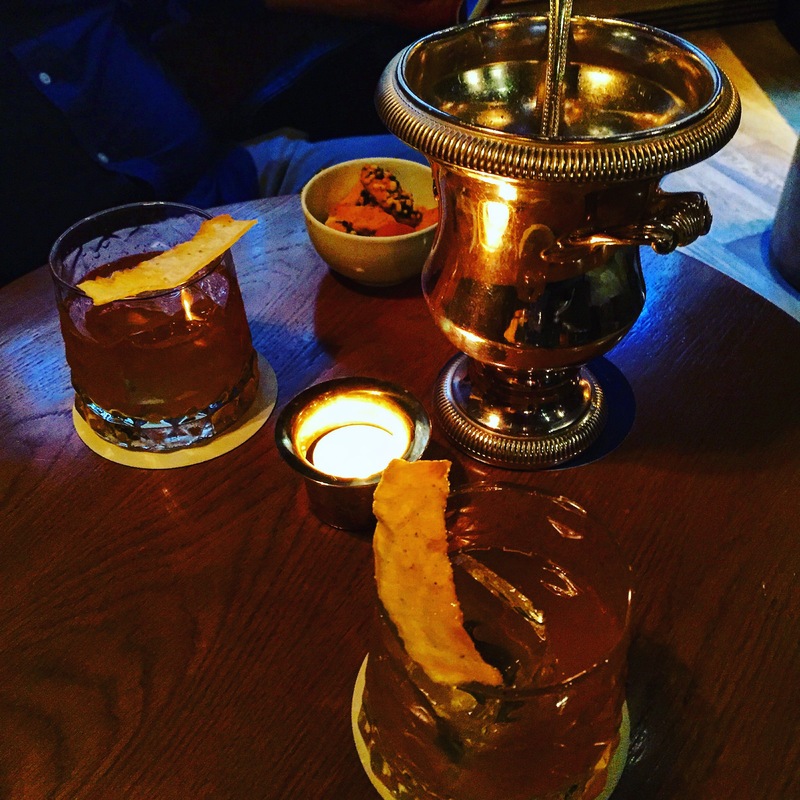 A bowl of punch*, that most English of alcoholic mixtures, seemed most appropriate (Lloyd’s novel refers to the East India Company, where we get our love of punch from), so we visited the Punch Room at the London Edition hotel. This is a small bar, hidden at the rear of the hotel lobby, and in keeping with the current trend for speakeasies, completely anonymous from the outside. The hotel suggests a strict reservations-only policy, but when we were there it seemed to me that hotel residents are (quite fairly) treated more relaxedly. The benefit of the system means that one visits a busy, but not crammed bar. There are two rooms – one with a fabulous stand-alone serving bar where all the mixing takes place, the other an even quieter, smaller space with comfortable armchairs. The design is apparently to suggest a gentlemen’s wood-panelled club room, though here the materials used are quite light and modern and the chairs low, but this means the space is warm and inviting, not dark and oppressive. We drank the Arrak punch (arrak, lemon juice, chai tea, honey essence), which packed a… kick (avoiding the obvious joke), after starting with a glass of their complementary house punch. Both were really lovely: warming, sharp & refreshing. The good thing about a punch is the sharing nature of the drink – it’s fun to ladle out the mix into your glasses – and the higher juice content against a lower alcohol perecntage means these are longer drinks, to be sipped slowly while talking, making them ideal for a conversational sort of an evening.